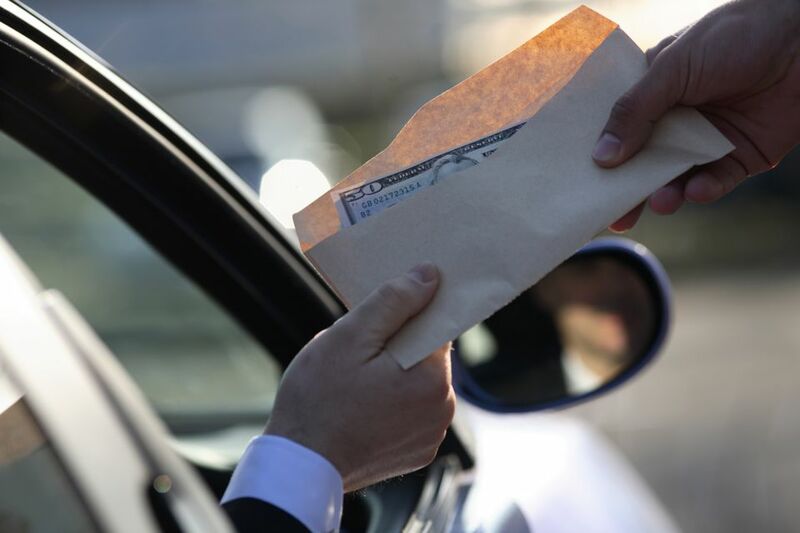 The Spanish word mordida (mor-DEE-dah) directly translates to "bite," but in Mexico, it is a slang term meaning a bribe—usually one paid to a public official. The more formal word for a bribe is soborno. Mordidas tend to happen when a police officer pulls a driver over and offers to disregard traffic violations in return for a cash payment. Mordidas are illegal, and should not be offered or paid. If you get pulled over in Mexico, there are some steps you can take. Giving a mordida is illegal, and the Mexican government has been working to crack down on these practices. Although these situations don't occur often, it is important to note that cops tend to target tourists and visitors as they are more likely to feel intimidated by a foreign police officer. You are most likely to experience a mordida when you're driving in Mexico and are stopped by traffic police. If you are pulled over, stay calm and present your driver's license and registration. If the officer brings up a ticket, request that the cop take you to the station where you can fill out the appropriate paperwork and pay your fine legally. Fines for traffic violations in Mexico are usually not that expensive. Plus, if you pay a ticket within five days of receiving it, there is usually a discount, so it is advisable to pay as soon as possible. Unfortunately, there have been cases of cops pulling tourists over when they haven't done anything wrong. If this happens and they try to pressure or intimidate you to pay a mordida, firmly decline, even if they try to bargain the price. Do not encourage mordidas in any way. Instead, repeat that you haven't done anything wrong, and if the police officer persists, ask to be taken to the station so you can talk to the police chief. Usually, at this point, they will let you go with a warning. If they do take you to the station, explain the situation, and in the worst case scenario, you may have to pay a small but legal fine (although that's unlikely to happen). Driving in Mexico and following the traffic laws is difficult because the rules are not clear. In addition, many roads are in poor condition with potholes and, in rural areas, animals grazing nearby or standing on the roads. There is road assistance as you drive in Mexico should you have car trouble. If you have an emergency while on the road, you can contact the Green Angels. The Green Angels offer roadside assistance on Mexico's federal toll highways. When you purchase gas in Mexico, there is a chance that you will be scammed. It's important to check to make sure the counter on the pump starts at 0.00. Also, double-check the denominations of bills that you pay with and check the change you receive.